Not gifted with blinding pace but blessed with great anticipation and a magnificent pair of hands, David Grant was a talented and versatile footballer who almost personified the role of a utility. A mainstay of St. Kilda teams throughout the late 1980’s to early 1990’s, Grant accumulated nearly 200 VFL/AFL games in a highly respected career. Born in 1966, David Grant’s reputation as one of the most outstanding junior footballers in Tasmania saw him invited to train with both Richmond and Hawthorn as early as 1980, aged just 14. The 1982 season would prove to be the most important of Grant’s young career – making his senior debut for City-South in the NTFA, captaining the Tasmanian U/16 side and being named an underage All-Australian – and before the season had ended he had been signed by VFL club St. Kilda, who had observed Grant playing against one of their junior development teams. After spending the 1983 season further developing in Under 19’s and reserves football with the Saints, Grant made his senior debut for St. Kilda in Round 10 of 1984, but would make only one further senior appearance for the season. After another eight games in 1985, Grant became a regular player in 1986, playing all 22 games (mostly on a half forward flank) and finishing runner up to Tony Lockett on the Saints goalkicking table with 29 majors – a fine effort in a side that only won two games all year. It was at this point that Grant shifted into his more familiar role in defence, and for the better part of the next decade Grant faithfully patrolled a half back flank for the Saints, performing the role with such aplomb that he finished runner-up to Nicky Winmar for St. Kilda’s Best and Fairest award. His finest season was almost certainly 1991: he played 20 games in a St. Kilda side that played finals, represented his home state in a match against Victoria at North Hobart Oval, and was named on a half back flank in the All-Australian team. Such was his versatility, Grant was named in every single position on the ground at least once during his 191-game career at Moorabbin. Extremely loyal to the Saints, Grant refused to leave when he and teammate Jayson Daniels were controversially traded to Sydney for Swans superstar Barry Mitchell in late 1992. 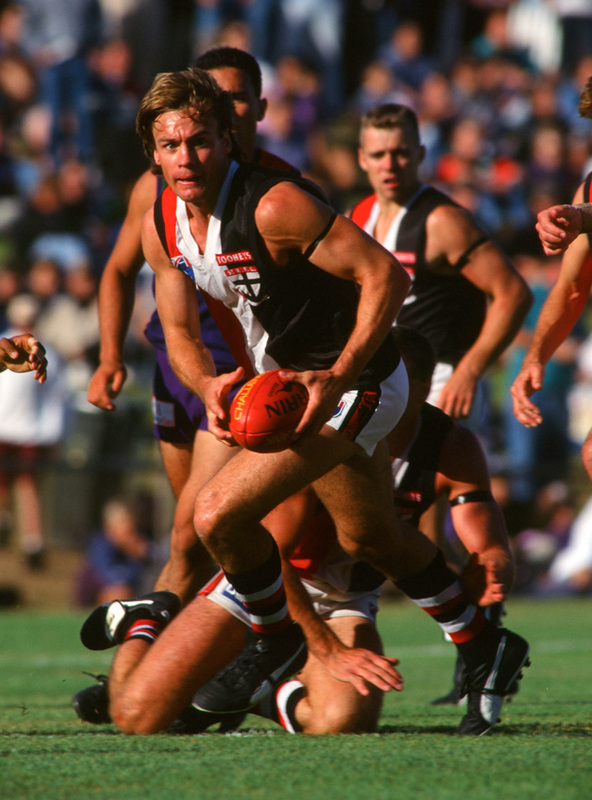 Nevertheless, Grant’s time at Moorabbin did end in a trade, and at the end of 1995 the now 29-year old Grant found himself in Melbourne colours. He would spend just one season with the Demons, playing seven of the first eight games before retiring from AFL football just two games short of 200. This was not the end for Grant in senior football however – he joined VFA side Sandringham in 1997, and in his first season with the Zebras he tasted his first – and only – senior premiership success, as Sandy proved too good for Frankston by 29 points. After more than 250 senior games in an outstanding 17-season career, Grant retired at the end of the 1999 season.